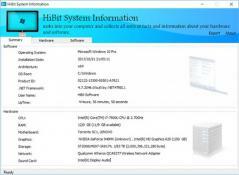 HiBit System Information is a reliable utility that can retrieve detailed information regarding your PCs hardware and software. You can also use it to create reports based on the gathered data. In the main window, a section is dedicated to your computer’s hardware, another area displays software related details and the Summary section provides information for both hardware and software. When it comes to hardware data, HiBit System Information displays details about the CPU, motherboard, RAM, network, BIOS, storage, display and so on. The Software section provides information regarding the operating system, system drivers, installed applications, security, services, event logs, and processes. All the information provided by the program can be included in a HTML report which you can save on your hard drive for later analysis. SysGauge monitors the CPU usage, memory status, disk and network activities. System analyser, diagnostic and benchmarking.